All these lines have the signature of Professor Ana Aslan imprinted on the packaging. 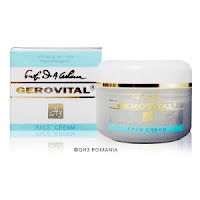 Professor Dr Ana Aslan Gerovital H3 cosmetic line was part of a comprehensive geriatric program designed to tackle skin problems that come in womens’ 40s. The basic principle was to supply skin with those components and boost those processes which help mature skin look and feel younger. The duet Emollient Moisturizing Day Cream and Nourishing Night Face Cream has been launched in1967 by the Farmec Cluj Napoca cosmetic factory. The first adjustment to the Gerovital H3 formula was a consequence of international regulations. The main "anti-aging" ingredient, procaine, was banned internationally in 1996. Under these circumstances, the formula had to be redesigned in Farmec laboratories, introducing the only derivative of procaine (PABA) internationally accepted along with other active ingredients so that performance of the Gerovital H3 line had not been compromised, but enhanced. 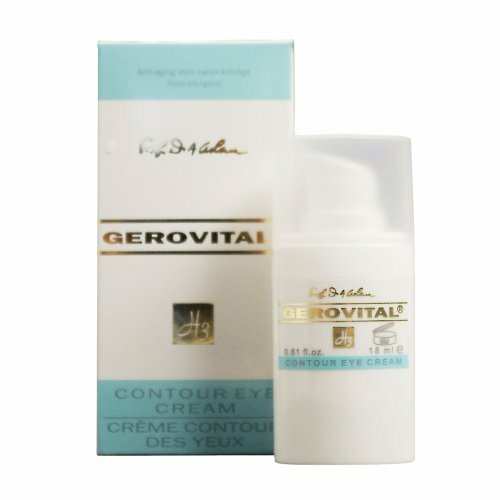 Launched in 1998, the Gerovital H3 Eye Cream was another important milestone. The sensitive area around the eyes first shows the signs of aging. And it needs to be addressed with specific anti-wrinkle products. The eye cream is actually the first anti-wrinkle product used by most women. 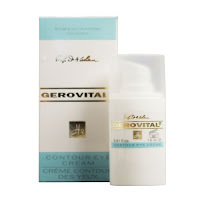 The Gerovital H3 Anti-Wrinkle Eye Contour Cream had been design around the classical Gerovital H3 concept. New products have been added to the line as a natural process: daily cleanser, toner, face mask, exfoliating cream, hand cream and hair lotion. 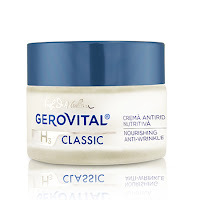 The most notable change for the Gerovital H3 Line was the release, in 2006, of a new face care duet, moving forward the classical one invented by Mrs Aslan. Prof. Aslan left a cream addressing age 40+, when aging problems are already visible. It was so perfect for mature skin (40+) that was „unacceptable” for the 30 years old complexions. But starting 30’s we should begin prevention. Wrinkles smooth up to 84.2%. Skin suppleness is enhanced up to 94.7%. Hydration is increased up to 53.8%. Lifting effect is increased up to 43.37%. Firmness increases up to 42.37%. 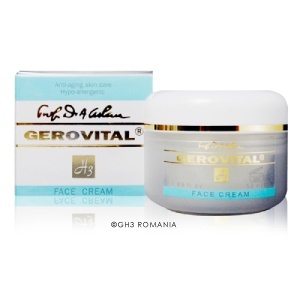 In 2010 Farmec launched on the market a new anti-aging line from the Prof. Dr.Ana Aslan Gerovital H3 family. 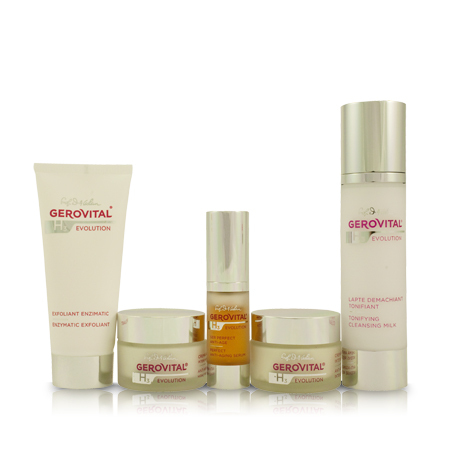 A triad of innovative principles, perfected due to the new discoveries in understanding the mechanisms of skin aging, was the core of the Gerovital H3 Evolution line. GP4G regenerates the skin from within, as a source of pure energy which supplements the diminished capacity of the cells to regenerate and stock energy. 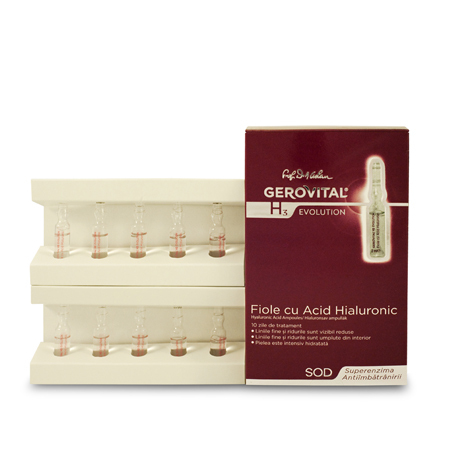 The products of the Gerovital H3 Evolution line are structured on two age groups, to better respond to the specific requests. The products meant for women aged 45+ are especially created to solve more complex skin problems caused by photo-aging and the diminishing estrogen production around menopause: accelerated loss of skin elasticity, deep wrinkles’ formation, dark spots occurrence. The products from this range are rich in nutrients and offer an emolliating feeling, a long lasting hydration and a visible increase in the skin tonus. A superstar of the Gerovital H3 Evolution line is the Hyaluronic Acid Ampules. The ampules contain a serum rich in Superoxide Dismutase (SOD) and pure liposome Hyaluronic Acid, with intensely moisturizing effects and a dual action, restoring the skin’s water reserves and reducing transepidermal water loss. 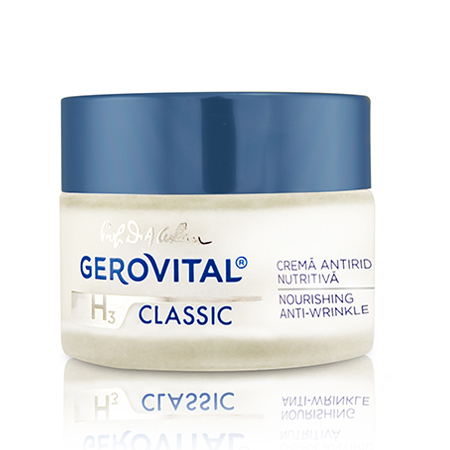 In 2013, the Gerovital H3 line reinvents itself with better looks and stronger anti-wrinkle capabilities. But it still stands up to the high standards set by Ana Aslan who, in the 60s, pioneered the advanced innovative cosmetics – it has a modern design and is a winner when it comes to younger and wrinkle free looking skin. The new Anti-Aging Complex H3 (Hyaluronic Acid, Vitamin E and Juvinity™) patented by the Farmec researchers is especially designed to prevent and reduce the signs of biological aging of mature and dry complexions, having a geriatric effect on skin. Beside Anti-Aging Complex H3, each product is enhanced with other active ingredients to perfectly serve its purpose. Lightweight or rich moisturizers are high in oils, natural waxes and fats with strong power cell reconstruction capabilities. 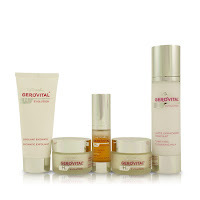 Part of the Gerovital H3 Classic range, the 3 Retinol based products contain Retinol Molecular Film, a formula that preserves optimal Retinol stability, enhances skin absorption of Vitamin A through the epidermis and minimizes irritation commonly associated with the use of retinoids. The results of instrumental evaluation made by Farmec researchers show a significant anti-wrinkle effect and a visible increase in skin firmness (up to 65.7%). 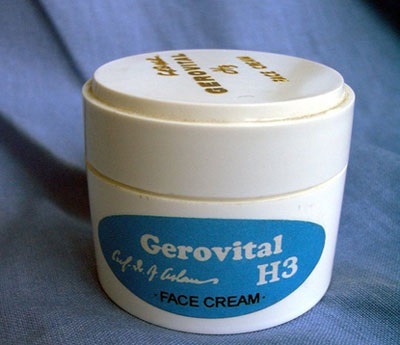 2014 was the year of the first Gerovital H3 line of products, specifically designed for men. 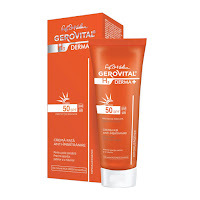 Gerovital H3 MEN line respects the specificity of men’s skin (compared to women’s) due to different physiological features and hormonal and metabolic processes. The differences between men and women’s skin demand products that address specific needs. is generally affected later by wrinkles than women’s skin, but they are usually deeper. This is why the Gerovital H3 MEN products have a light texture, are easy to apply and facilitate a rapid absorption into the skin. 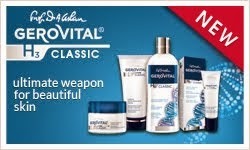 At the same time they are multi-functional products, addressing different skin problems. 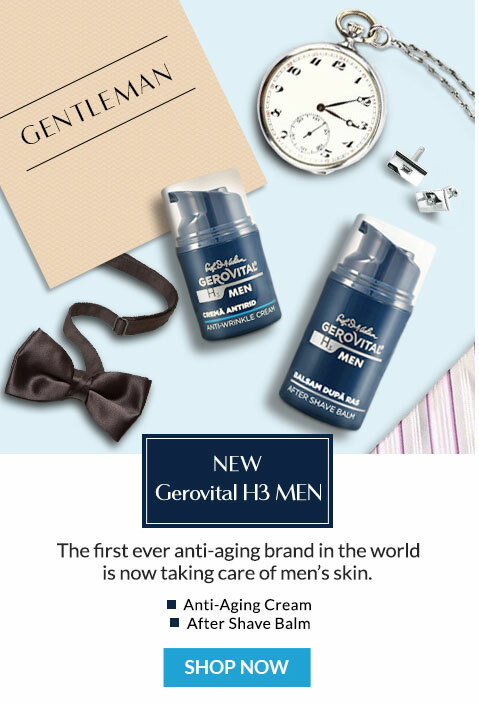 Similar to all women skin care products, Gerovital H3 MEN line contains the patented Gerovital H3 Anti-Aging Complex which prevents and eases the signs of premature aging, helps dry and mature complexions, having geriatric effect on the skin. Prof Dr Ana Aslan GerovitalH3 Derma + line is the first dermato-cosmetic line from the series, perfected by the Farmec researchers working close with specialists in healthcare system. It has been developed as a pharmaceutical concept, aiming to tackle the most common skin and hair problems. The line incorporates high-performance active ingredients that help you delay aging signs and heal affected skin or hair: Matrixyl® synthe’6®, Hyaluronic Acid, Sepilift™ DPHP, Aquaxyl, Gatuline® Expression Extract, Haloxyl®, Ceramidyl-Omega 3-6-9, Ac.net™, Soothex®, Centerox™, Sepitonic™ M3, Sebaryl®, Procapil®, Bio-Capigen, Zanthalene®, etc. 100% of subjects tollerated the products. Scalp pruritus reduced up to 80%. 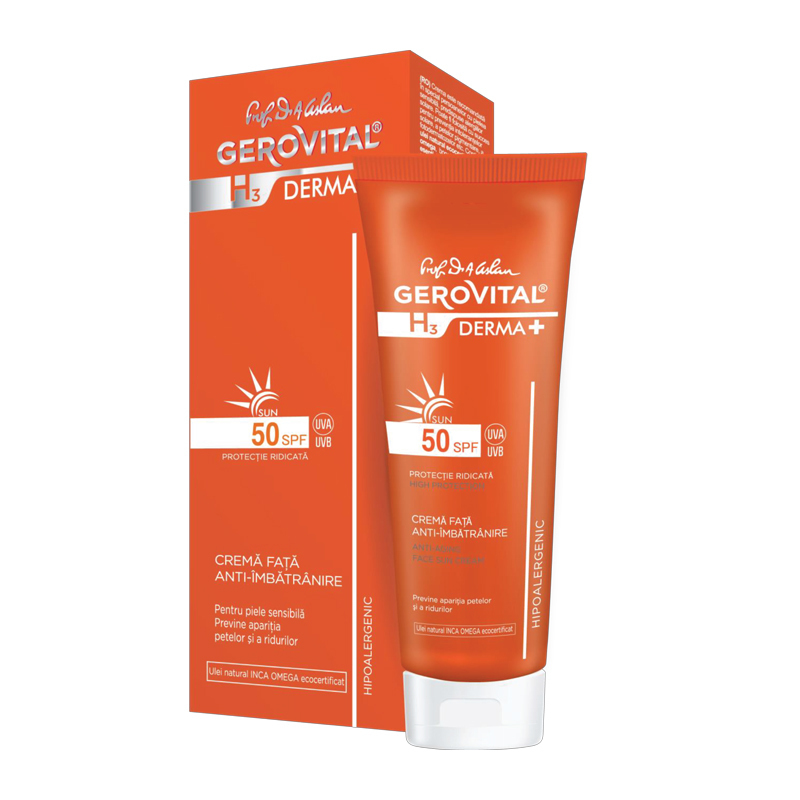 Gerovital H3 Derma + Sun line has a high performance formula based on natural ecocertifyed Inca Omega Oil, rich in essential fatty acids omega 3-6-9. The natural Inca omega eco-certified oil (rich in omega 3-6-9 essential fatty acids) restores the integrity of the protective lipid layer, normalizes the keratinization process, improves the skin’s hydration level. The products are also high in delta and gamma natural tocopherols (family of Vitamin E) that protect the DNA and the cell membranes from the destructive action of the ultraviolet radiations. Ensures a balanced spectrum protection from UVA & UVB rays. Hypoallergenic - proved by HRIPT (Human Repeat Insult Patch Test) tests made on sensitive skin. Respects the EU recommendations for protection against the harmful effects of UVA / UVB radiations.